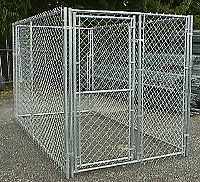 The size and shape of our kennel runs are limited only by your imagination or need. Kennels are basic modular units and can be combined to meet your immediate or future requirements. Construction All galvanized materials for long lasting and durability. All corners are notched and welded for strength. Kennels can be custom built to any size.